Target, the American retailing giant, announced this week the closing of its Canadian operations after less than two years in the market. This amounts to the closing of 133 stores and the loss of 7 billion USD invested by Target in its Canadian roll-out, including the purchase of the Zellers retail chain. It’s a classic case of biting off more than you can chew. Target banked their first international expansion on the high level of brand awareness among Canadians due to cross-border shopping and international media. While Target is a giant in the American retailing space (and there are some unique reasons why their Canadian expansion failed) the basic requirements for successful cross-border commerce apply across the board for businesses of any size, online or brick-and-mortar. For any merchant, Target’s mistakes are a treasure trove of lessons about what not to do when selling across borders. Compared to the US, Canada’s consumer market is tiny (and spread out). Shipping goods over the longer distances required is a significant added expense (and the cost of fuel is higher). Minimum wage is higher than in the US. The last point could have been partially worked around by operating an e-commerce store in Canada, which would require less staff north of the border and would cut down on real estate costs. It’s remarkable, in fact, that Target never did so. 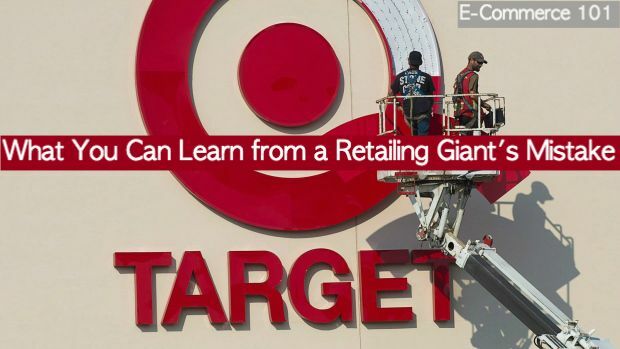 Opening an e-commerce store could have been an excellent way for Target to test the market, grow their brand awareness and build enthusiasm for their expansion. Instead they opened over 130 physical locations with no trial period, little local brand development and an insufficient distribution chain. Consumers complained of empty shelves, understaffed stores and high prices. There was little to distinguish Target stores from their failing predecessor Zellers and they didn’t offer anything to compete with established chains like Canadian Tire, Home Depot and Walmart. 17,600 employees losing their jobs. 7 billion USD lost in Canadian roll-out operation. 681 total days in operation before announcing closing. We don’t need to come up with a hypothetical worst-case scenario for entering a new cross-border market, because this is it. One of Target’s biggest mistakes was to overlook the ways in which the US and Canadian markets differed. They didn’t know how to compete with the loyalty consumers already felt toward Canadian Tire, Home Depot and Walmart. Target assumed their winning formula at home was going to be a success elsewhere, not accounting for how localised shopping habits can have a major effect on the retail space. Is there an audience for your product in this new market? If so, how does it differ from your local audience and how can you tailor your marketing and services to accommodate that difference? What makes a successful business is the ability to provide something consumers aren’t getting anywhere else – you need to carefully analyse the competition in a new market to ensure that you can bring something new to the table. If you can’t, then that market may not have room for you. Check out our article about Knowing Your Customer (KYC) to learn more about identifying and addressing your target audience. Target’s entrance into the Canadian retail space happened overnight. First there was nothing, then 130+ stores. What if they had started with just 20 stores, or only 1, or even just opened up their online store to customers north of the border? They could have tested their products in small localised regions, gathered preliminary feedback and worked with focus groups. If Target had taken the time to do so, they would have had the chance to adapt their business to more accurately reflect the needs and desires of Canadians. Preliminary research can never fully prepare you for the realities of entering a new market. No matter how confident you are, don’t dive in like Target did – start by dipping your toes in the water. Start small and plan for an exploratory phase. This is your chance to discover any pain points in the current market conditions and what effect they may have on your business. Once you’ve confirmed demand and refined your product, only then is it time to fully invest your resources. Canadians were expecting the same high quality and low cost they experienced at Target stores in the US. What they got was empty shelves and high prices. Target promised to be a new major player in the Canadian retail space but couldn’t keep that promise. And how did it turn out? 7 billion USD down the drain, 130 empty stores and thousands of people out of jobs. On top of that, they’ve compromised their ability to ever do business in the Canadian market again. Target will be a case study for years to come about what not to do in international expansion. When you expand your business into a new market, be careful not to overextend yourself. Shoppers are savvy. With e-commerce and cross-border shopping, consumers will compare products and prices from around the world. If your potential customers notice a huge disparity based on where they live, that’s going to be hard for them to swallow. Don’t forget that you’re going to have to live up to all the promotion and hype you build. Your potential customers are expecting you to provide exactly what you’ve promised – letting them down is a sure-fire way to not only lose a customer but to seriously damage your long-term reputation. Entering into a new market doesn’t have to be a game of chance. The poker pros know that you never go all in unless you’ve got nothing to lose. That’s why we’re launching a series of articles designed to help you prepare for tackling a new international market. Keep an eye out in the coming weeks for “Everything You Need to Know about Selling in Germany”, the first of our articles detailing the regulatory requirements, market conditions and payment habits of a specific country. In the coming months we’ll be visiting countries in all parts of the world to help you take the first steps to expanding your business across borders. Subscribe to the DalPay Blog and follow us on Facebook and Twitter so that we can be your first source for everything you need to know about news, developments and strategies in cross-border payments and the e-commerce industry.